When I was young, my mom always hung our laundry outside to dry. I adored the way it smelled afterwards, infused by the enchanting aromas of lush green grass, fragrant flowers, tall evergreen trees, clean country air, and warm sunlight. I treasured drifting off to sleep amidst bed sheets permeated with these sweet scents and loved the way that the freshly laundered clothing smelled against my skin. 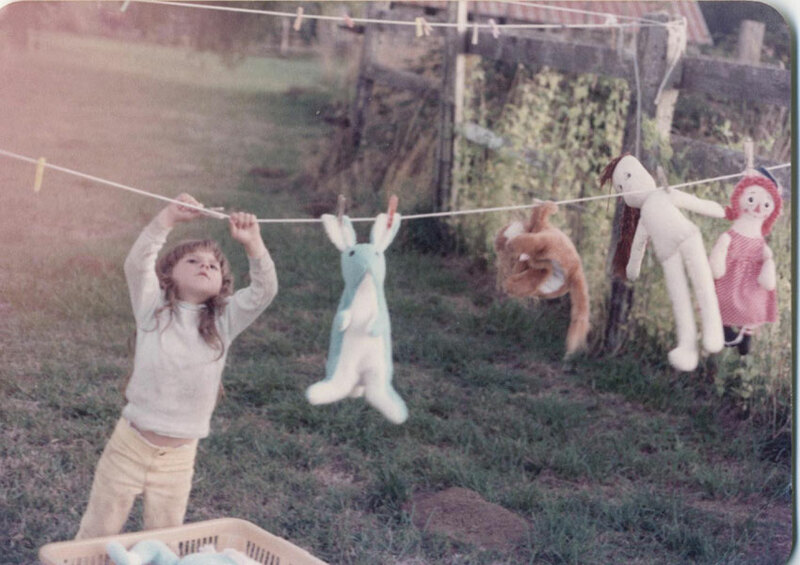 One afternoon, my mom found me pinning all of my stuffed animals and dolls on the clothes wire and snapped this photograph. When she asked me what I was doing, I told her that I was hanging them up so that they would smell like the sunshine too. Many commercial laundry products appear to be natural with names that include words like "fresh," "spring," "air," or "breeze," but unlike pure sunshine, these scents are far from natural. In addition to synthetic fragrances, these products contain other nasty ingredients that are known toxins, carcinogens, and neurotoxins. Whiteners, cleaning agents, fragrances, and other common ingredients in laundry products have been linked to serious health conditions. They can cause allergic reactions, irritate the eyes, nose, and throat, can trigger asthma attacks, and worsen allergies. In addition, many of these chemicals are not safe for our water supply and studies have proven that they are highly toxic to fish, thus endangering the environment as well as our own health. Scary? Definitely. Fortunately, there are many wonderful alternatives available in natural food stores and co-ops. Just make sure to carefully read the ingredients to ensure that they really are natural and safe for you and your family. Better yet, you can make your own laundry products using these recipes! Not only is Carol our Human Resources Director, she is also a highly talented crafter and gardener. Aside from making delightful handmade soaps and natural body care products, she also bakes delectable pies and treats and has an incredible garden. 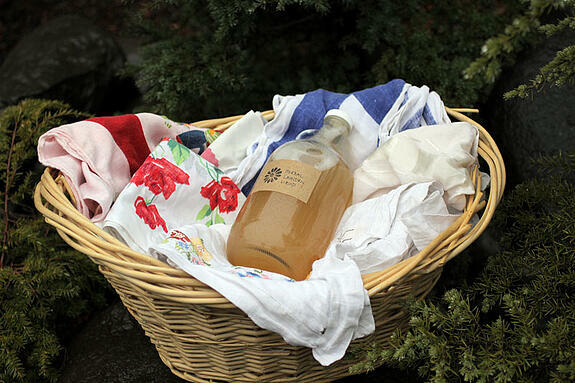 Carol has generously shared this wonderful recipe for natural liquid laundry detergent with us. essential oil of choice (optional). Some organic favorites are: cedarwood, eucalyptus, geranium, grapefruit, lavender, lemon, mandarin, peppermint, rosemary, sage, spearmint, sweet orange, tea tree, or ylang ylang. Pour hot water over the soap nuts and steep for at least 30 minutes to an hour. You can also steep them overnight. After steeping, cover the soap nuts and simmer over low heat for 30 minutes. Strain into a bowl and reserve the water. I use our stainless steel funnel with strainer. You'll have a generous quart of liquid remaining. Reuse the soap nuts for another batch if you want! You can skip the soaking process and go straight to adding another one and a half quarts of water. Simmer for 30 minutes and strain like before. Once the solution has cooled, add essential oils (optional). I use four tablespoons soap nut liquid plus two tablespoons of borax powder per load (with hard city water). This laundry potion works wonders, as even old towels and sweaty clothing come out smelling line-dried. This recipe garners enough for two batches. Try keeping one in the fridge and use the other one immediately. I prefer to strain into two half gallon canning jars. I also make hair wash from a third soak and simmers it with approximately ¾ quart of water. This strained liquid mixed 2:1 ratio with aloe vera gel foams nicely but not like commercial shampoo. It rinses clean and without much residue. Rinse with vinegar afterwards. No need for conditioner. Prewashing is helpful for heavily soiled clothing. This solution is gentle, utilizing natural elements to help lift dirt and stains. Essential oils can impart therapeutic properties, making your clothes refreshing, stimulating, relaxing, or calming. Plus, they lend their wonderful scents to the laundry, giving it a spicy, floral, woodsy, earthy, minty, or citrusy aroma. Place clothes in washer and add warm water to cover them. Combine vinegar, salt, and essential oil (if using), and add the mixture to the washer. Allow clothes to soak for an hour or longer, then proceed with laundering.